Scientists at Cambridge University have discovered that plants give bees a helping hand to clamber into their flowers. 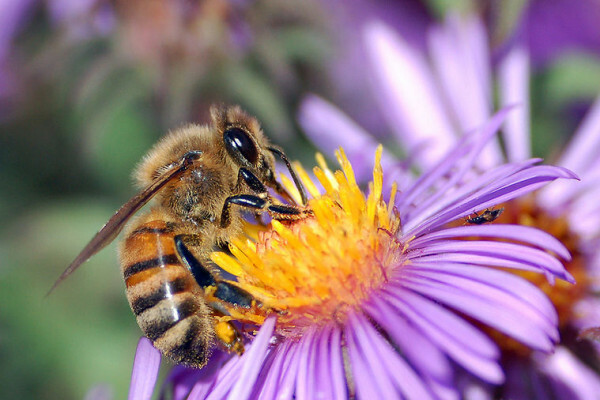 Writing in Current Biology, Beverley Glover and her team have found that a layer of conical-shaped cells that cover petal surfaces provide microscopic toe-holds for bees and other pollinators. They made the discovery by cleverly adapting snapdragon plants to produce a mutant strain that looked and smelled identical to a normal plant but lacked these conical cells. Tests on bees showed that the animals universally turned their noses up at visiting the blooms. To prove that it was the leaf texture that the insects were responding to the team made casts of the two different petal surfaces using epoxy resin and loaded these 'fake flowers' with sugar solutions. Critically, when these epoxy casts were placed horizontally the bees showed no preference, but as soon as they were hung vertically, so that the bees had to cling to the surface in order to drink the sugar solution, there was a striking preference for the petal casts taken from the plants with conical cells. 'This is like bee velcro,' says Glover. 'Flowers have evolved these cells so that pollinators can get a grip on them.' This makes the process of pollination much more efficient for both plant and insect, and also offers insects a metabolic boost - the team have shown that these same cells also act as miniature solar panels that soak up sunlight to warm up nectar in flowers, saving insects some energy.